My recipe began with Hugh Acheson’s in A New Turn in the South: Southern Flavors Reinvented for Your Kitchen (2011; pg. 48). I reduce the fat by using half the mayo, substituting non-fat plain Greek yogurt for the other half. This is anathema to the traditional Southern versions. But, I don’t like a heavy mayo-ness I’ve encountered in some no-doubt prize-winning homemade pimiento cheeses, so don’t be surprised that I was attracted to Hugh’s low-mayo proportion recipe. Pick a good sharp cheddar. Hugh says aged 18 months is good. I have used a 12-month reduced-fat Irish white cheddar from Trader Joes with excellent success. 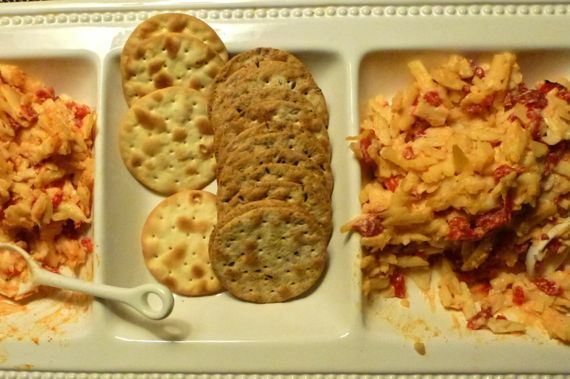 Begin preparing the pimiento cheese by popping your cheese (1 lb.) in the freezer so it gets a bit more solid and easier to grate. Peppers. Yes, I cheat on the peppers, too. I use the jarred ones (not pickled), and don’t do my own roasting and peeling. He calls for two large peppers, so approximately that amount of pepper-flesh is what I use. Again, I’m sure I’m sacrificing some flavor by using the jarred and not fresh-roasted, but I don’t have a restaurant staff to help me out, either. The problem with the jarred ones is that they’re too wet. Try to find a brand with “meaty” peppers with thick walls. Drain, even squeeze to remove liquid. Chop and set aside while you do the cheese grating, so more liquid can seep out. Hugh says two large peppers. I err on the side of more, and, besides, what is “large”? Go for three if you like. One more thing. Hugh adds smoked sweet paprika plus a pinch of cayenne. I essentially merge those two flavors together and use smoked hot paprika, and people love it. But it’s not a traditional flavor—a bit spicier than your grandma’s pimiento cheese. Grate the cheese. Hugh says by hand. I think a good food processor would also work, but I confess I’ve only done it by hand for this recipe. Don’t fret over long strands; they will be broken during the stirring process. Put cheese in large mixing bowl. Now add the drained, chopped peppers and the binding mixture to the cheese. Hugh says you “must” stir with a wooden spoon. I have used various non-wooden-spoon implements and I can’t believe I reduced the quality of my pimiento cheese. Let stand for perhaps an hour for flavors to meld. Or, dig in if you can’t wait!